Hashim Khan is the indisputable squash legend, whose star shines bright in the cloudy firmament of Pakistan’s troubled sporting history. He was born poor and with limited means. His rise to the pedestal of the world champion is unique in the annals of modern sports. 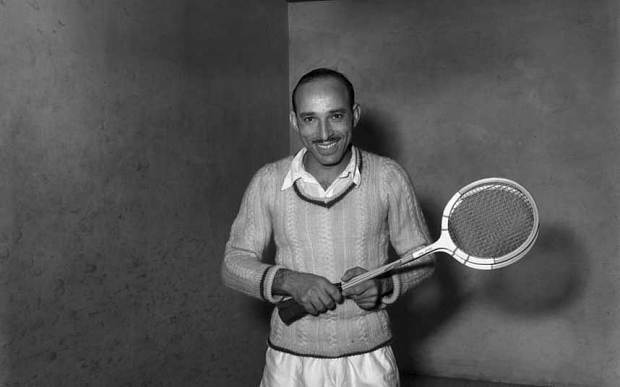 He earned the unique distinction of winning the British Open Squash Championships for an unprecedented seven times, from 1951 to 1956, and then again in 1958. Hashim Khan was born in Nawakille, a small village near Peshawar sometime between 1910 and 1914. His long inning on earth came to an end on August 18, 2014, in Aurora, Colorado, United States. Khan began working as a ball boy at a officers’ club in Peshawar before independence. His father Abdullah’s position as the head steward made his entry into the club, where no natives could enter, possible. Young Hashim watched the game intently and when the officers cleared the courts, he went out to practice, barefoot. Sometimes he traded his lunch for lessons. The hard work eventually got him a job teaching squash at the club and led to the belated break that made him a star. From such humble beginnings, he went on to become a champion and the patriarch of a sporting dynasty. No one can deny that Khan was a gifted athlete and was bound to reach stardom, however, one aspect that may not be as well-known today is the support lent to him by the officers of the Royal PAF station Peshawar. Khan was in his 30s and a national champion when a player he regularly defeated, Abdul Bari of Bombay, made it to the final of squash’s British Open. Till then Khan had not played internationally, but Bari’s success prompted him to aspire to become a world champion. It was then that the officers of RPAF station Peshawar joined hands to send him to the tournament in 1951. My father late Air Commodore Muhammad Yamin was one of the young officers, who contributed to making Hashim Khan’s trip to the British Open possible. The credit no doubt goes to Air Marshal M. Nur Khan, then commander of RPAF Peshawar, for mobilising his officers to raise funds to kit and send Khan on his dream trip to England. He put faith in a man, who by ordinary standards past his sporting prime and was totally unused to the rigours of an international sporting meet. My father would recall that for a long time he and his fellow officers were charged a fixed sum as contribution for Hashim Khan in their monthly mess bills. The band of brothers and their intrepid commander had thought it correct to put faith in an unknown commodity. Khan lived upto the trust reposed in him and made his supporters proud by his achievements. At 36 and possibly more, seemingly past his prime, at least , Khan made an impressive debut in squash’s most celebrated tournament. He vanquished an array of international stars on his way to the final, where he defeated the man presumed to be world’s best player, the four-time champion Mahmoud Karim of Egypt in straight games. Khan won the Open for six straight years and the rest as they say his history. It is time now that PAF base Peshawar does a lasting favour to Khan’s legacy by instituting a sporting scholarship for a deserving young man or woman from the area. Hashim Khan would smile in heaven for this final honour to his memory.